Parking is an important consideration for Scots looking to buy a new home. 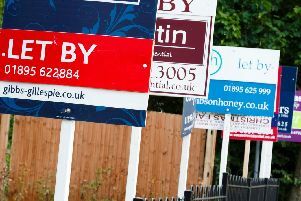 A new survey lifts the lid on the UK property market, with Scots sharing exactly what made them buy their homes. Wood flooring specialists Flooring Republic asked 250 Scots what led them to fall in love with their homes, and which factors they consider non-negotiable when buying a property - and between community appeal and room size, it seems Scots are swayed by more than an attractive price tag. Natural light is a key factor. After the BBC reported that the number of first-time buyers was at its highest in a decade, this new study reveals what it takes to get Scots excited about buying a house. With 71% of the vote, a safe and friendly neighbourhood took the top spot, followed by the price of the property (43%). In terms of what Scots love about their living space, room size came out on top - taking 46% of the vote. High ceilings are an attraction for many. For 33% of participants, a good-looking garden is what got them to sign on the dotted line - with a third of Scots saying some outdoor space is a must. Natural elements proved popular across the board, with a quarter of those surveyed saying natural light is what they love most about their home. Perhaps surprisingly, less than half of all respondents believe the price of a property is the most important aspect when it comes to making an offer. According to 43% of all respondents, parking availability is a key issue when it comes to deciding on a suitable property - with almost of half of Scots citing this as a non-negotiable when it comes to buying a house. In terms of a property’s appearance, it looks like it’s not just what’s on the inside that counts - with 17% of Scots saying they’re swayed by both exterior appeal and interior styling. Victorian buildings have plenty of appeal for some Scots, with 13% of participants revealing they bought their home because of high ceilings. Space proved a key concern for 38% of those surveyed, who said the number of rooms in a property would influence whether or not they bought it. For 14% of homeowners, accessibility is a deal-breaker - with proximity to local transport networks and amenities proving particularly important. Organisation addicts across Scotland declared practicality a priority when buying a house - with storage space scooping 14% of the vote. What do you consider to be the key factors when buying a house? What made you fall in love with your home?